From the initial drawings in 1963 Joe Harris, the creator of Underdog, mimicked Superman as virtually all superheroes have done. But Underdog was different, his weaknesses were obvious. 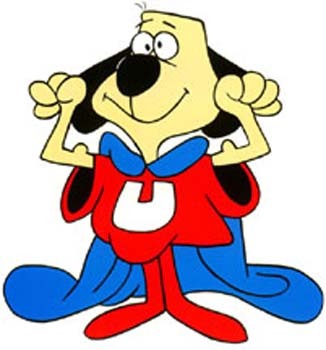 After his introduction, Underdog quickly became a pop culture icon. From TV guide to the Macy's Thanksgiving day parade to toys to comics to games, Underdog was everywhere. You can see some of those items in the collectible areas at the top. If you're like a million other people who are looking for the Underdog theme song it can be found on the left as well. This site is about enjoying Underdog stuff but it's also about collecting memories of your childhood. Hopefully as you see Underdog save Sweet Polly Purebred you will remember romping through the house with your brother or sister. Or it could be that you'll be reminded of your biggest worry as a child, will it rain? Or maybe you'll remember eating cereal that included the word "sugar" in the title and not caring. Whatever it brings to your mind I hope it's a happy memory. I grew up in the 1970's. When the best time of the week was Saturday morning cartoons. Underdog was always the first one I looked forward to every week. There was just something about this cartoon that touched me as a kid. When I got my first cassette tape recorder, guess what I recorded. Every single episode of Underdog. I still have them today tucked away at my parents house. I have since then collected many Underdog collectibles. My pride of my collection is a hand carved Underdog that a friend made for me back in 1991. The second is the cell of Underdog. I will have a list with pictures of eveything that I have collected over the years. 13 January 2010: 2 fan fiction underdog stories were rescued from the internet archive. Go check it out. One reprinted with author's permission. 20 January 2010: I am looking for Underdog Fan Fiction stories. If you have one or know of one, email me. I will be more than happy to publish it here. 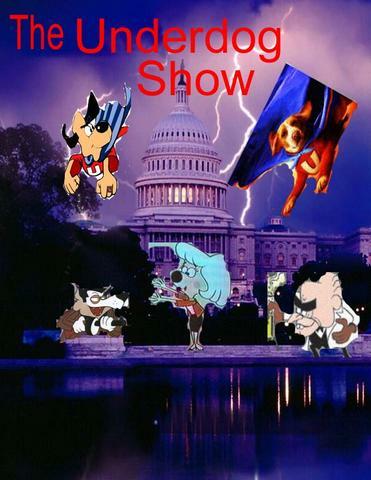 Watch the "Underdog Movie Trailer"
Picture the property of "The Undershow Show" Yahoo Group. Shown here with permission.